Norm Macdonald announced his new Netflix show on social media today, titled Norm Macdonald has a Show. The comedian recently revealed he was in talks with the streaming giant back in January of this year. Macdonald will join his good friend David Letterman on the streaming giant, and perhaps even Barack Obama, who is in talks with Netflix for his own show. Norm MacDonald has been hosting a YouTube chat show recently, which pulls in millions of views as well as lots of celebrity guests. Norm Macdonald has a Show is a Netflix talk show with the comedian as host, along with his trusty sidekick, Adam Eget, and one celebrity guest for each episode. The show is expected to deliver great and unexpected conversation, jokes and a behind-the-scenes look at Norm's world through his bizarre lens. 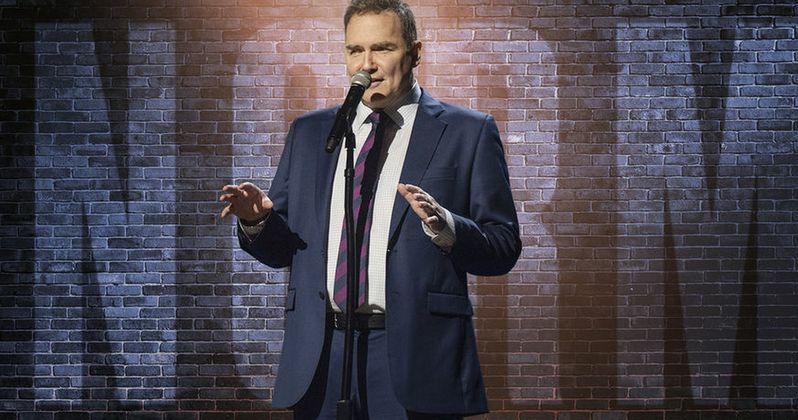 Norm Macdonald has a Show is produced under Macdonald's production banner, Anchor Spud Productions, along with Pygmy Wolf Productions in association with Lionsgate Television. So far, Netflix has ordered 10 episodes and David Letterman reportedly serves as location scout, according to the press release. Norm Macdonald rose to fame in the early 1990s when he appeared on Saturday Night Live and is known for his deadpan delivery and humor that some might call quirky. He was famously fired from SNL for reportedly making too many O.J. Simpson jokes during Weekend Update. NBC executive and longtime Simpson friend Don Ohlmeyer, fired both Macdonald and writer Jim Downey for their relentless attacks on O.J. back in the mid 1990s. The jokes, delivered in Norm Macdonald's trademark style are still pretty brutal today and O.J. Simpson has not forgotten them, politely declining to go on the comedian's YouTube show. Norm Macdonald then went on to movies and famously made Dirty Work with former Howard Stern sidekick Artie Lang, Bob Saget, Jack Warden, and a cameo by Adam Sandler as Satan. The movie was panned, but it has gained a cult following in the 20 years since its release. Macdonald is also known for his outlandish and unpredictable appearances on the Howard Stern Show where he is often brutally honest or making crazy exaggerated stories or telling 10-minute long jokes to get under the skin of Stern in a playful manner. Norm Macdonald's comedic style is not for everybody, and that's definitely a part of his charm. For those of who are fans of the man's work, this show is something to look forward to when it premieres. As for a premiere date, nothing has been officially announced at this time, but it seems logical that Norm Macdonald has a Show will make its Netflix debut later this year. For now, you can go back and watch some of his YouTube shows or check out some of his many appearances on David Letterman or Howard Stern. You can read the announcement of the show below, courtesy of Norm Macdonald's Twitter account.